(Vulpes lagopus) Artic Foxes have the warmest fur of all the mammals. We will always wonder how it came to be that Aurora Borealis ended up on a roof in Beverly Hills! What does the Arctic Fox eat? They are very opportunistic and will eat anything they can find such as arctic hares, lemmings, birds, berries, seaweed and fish. Usually between 8 to 10 years in captivity. How many arctic foxes can be born at a time? Litter size can reach 20! The largest litter size of all the carnivores. A usual litter consists of 3-11 pups. Arctic foxes are found throughout the entire arctic tundra, Alaska, Canada, Greenland, Russia, Norway, Scandinavia, and Iceland. Arctic foxes have the warmest fur of any mammal and even have fur on the bottom of their feet to keep them warm on the ice and snow. 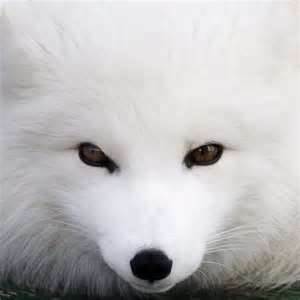 Arctic foxes have two different color phases and in both phases the coat changes color in summer becoming much darker. Aurora Borealis – She came to us in April of 2012 when she was between one and three years of age. She was on the rooftop of a house in Beverly Hills for three days before Animal Control captured her and sent her to a rehabilitator. Since arctic foxes are considered to be a restricted species by Fish and Game and cannot be released in California she was sent to us.